On a trip to London, England in 1998 we were fortunate to take a tour of the spectacular Westminster Abbey with its magnificent stained glass windows, beautiful marble statues and numerous memorials. 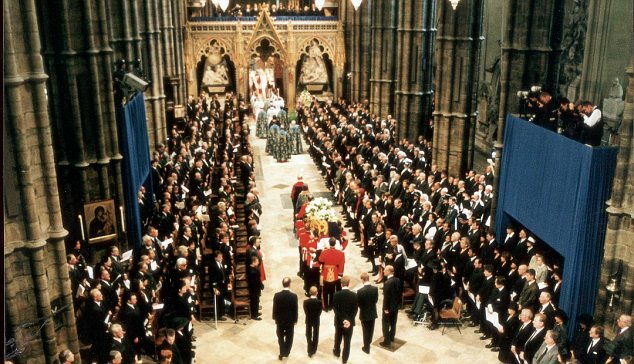 Personally, I had looked forward to seeing Westminster Abbey on this trip because I remembered watching the television coverage of Princess Diana’s funeral in 1997 and the wedding of Prince Andrew to Sarah Ferguson in 1986 which both took place there. 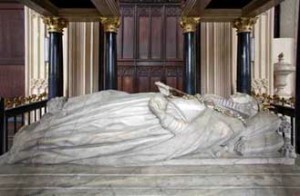 The Abbey is also the site of the tombs of British Royalty, such as King Henry VII and Queen Elizabeth I, as well as various prominent people in British history, such as Oliver Cromwell, which are buried within the chapels. 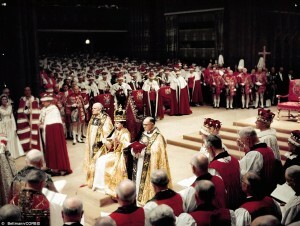 Since 1066, the Abbey has traditionally been the location of the coronation of the British Monarch with the last one taking place in 1953 for Queen Elizabeth II. 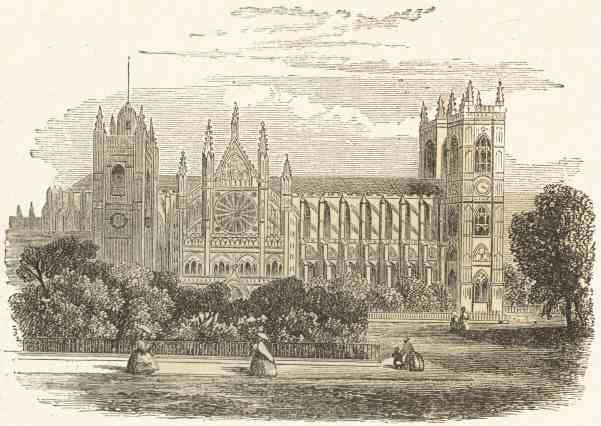 The history of Westminster Abbey begins when a small Benedictine monastery was built under the direction of the Bishop of London, later known as Saint Dunstan, in the late 960 under the rule of King Edgar. 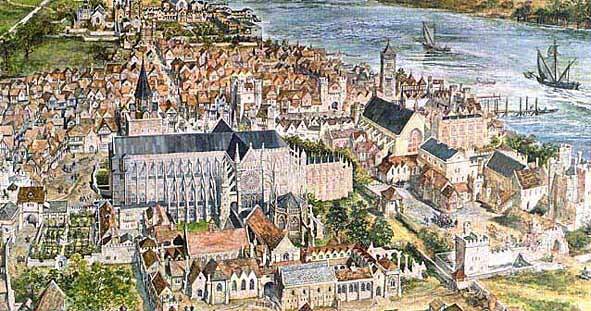 Then in the late 1000s, King Edward the Confessor began to rebuild St. Peter’s Abbey as a royal burial church conveniently located adjacent to the Palace of Westminster. This was a very timely decision given the fact that the work was completed in 1065 just a week before his death and he was buried in the church. Nothing remains of this old church, but its column bases have been found below the west end of nave of the present Abbey. In 1245, King Henry III started the construction on the current church building and the relics of King Edward the Confessor were removed from the old church and placed within a shrine in the new church. 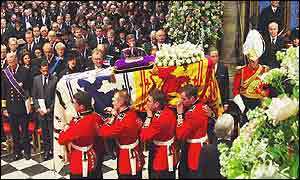 There are a total of 17 British monarchs, including King Henry III and Queen Elizabeth I, buried within the Abbey and the last to be buried there was King George II in 1760. 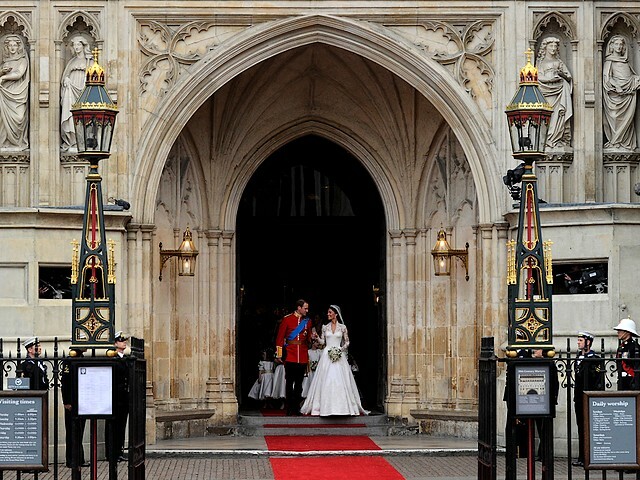 After that time, due to limited space within the Abbey, subsequent British monarchs have been buried either at St. George’s Chapel or Frogmore which is located just east of Windsor Castle. 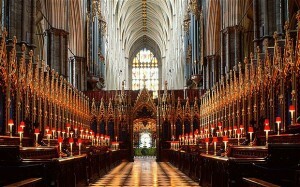 Throughout the years, Westminster Abbey has also been the site of many funeral services for members of the Royal family. 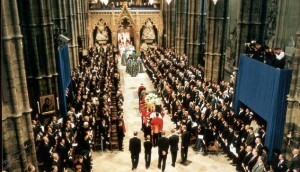 Two notable ceremonies were Princess Diana’s funeral service at the Abbey followed with her burial at the Spencer family ancestral home at Althorp in 1997 and most recently the funeral of Queen Elizabeth The Queen Mother followed with her burial in St. George’s Chapel at Windsor Castle in 2002. 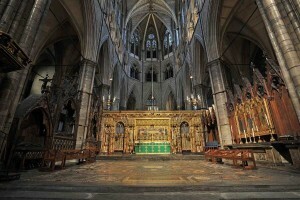 Westminster Abbey is a beautiful Gothic-style church located a short distance from the Thames River in the City of Westminster, London. 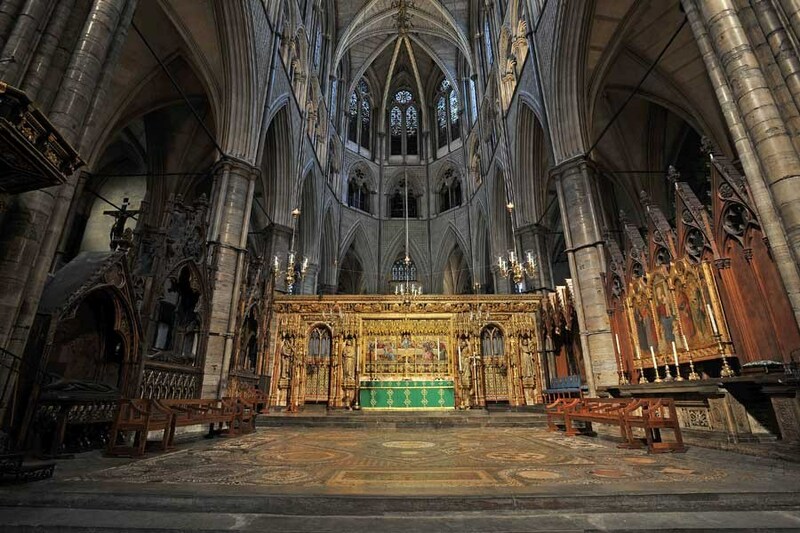 The Abbey was formally known as the Collegiate Church of St. Peter and is considered the most important religious building in England and also one of London’s most popular tourist attractions which is seen by over a million visitors annually. 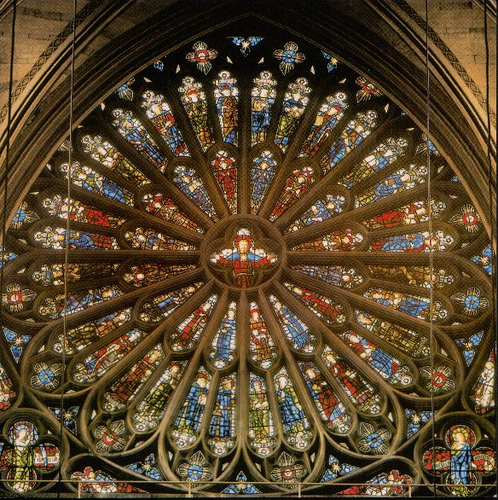 The interior design was generally English in style with a single aisle and a long nave but several French Gothic features include tall windowed chapels, a spectacular round rose window and buttresses used for exterior support. Like many churches, the Abbey was designed in the shape of a cross with the transept (the cross section of a building) 203 feet long and 80 feet wide while the nave measures 166 feet in length and over 71 feet wide with a soaring ceiling that reaches over 101 feet high. The floor space of the interior of the Abbey measures 32,000 square feet and for a normal church service the seating capacity is about 2,000. This seems very small compared to Queen Elizabeth’s coronation in 1953 which had a seating capacity of about 8,200. The exterior length of the building measures 530 feet and the West Towers are over 225 feet in height. 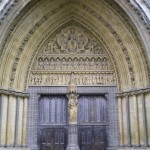 Upon arriving at Westminster Abbey, most visitors will enter through the Great North Door. Once inside the Abbey there is so much to see and we would highly recommend that visitors pick up one of the guided brochures or take one of the guided tours. 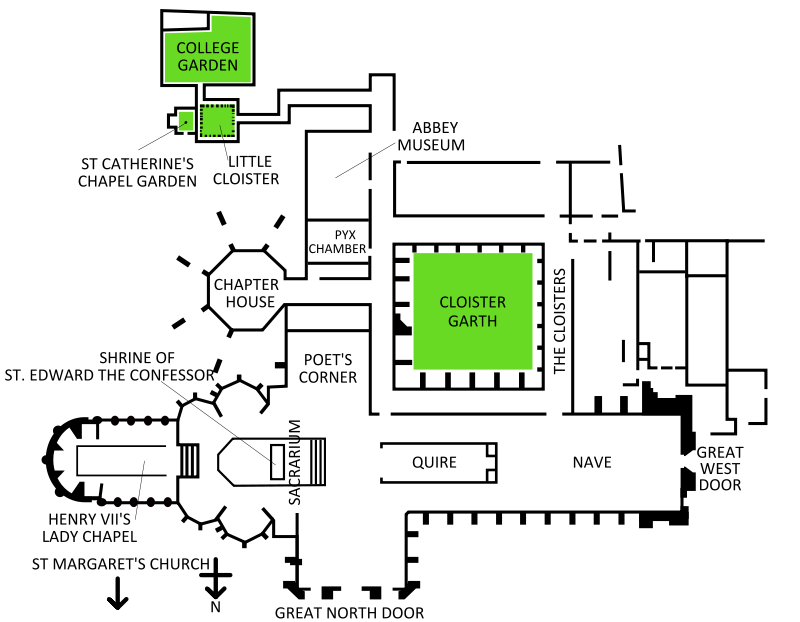 Below are descriptions of the various areas of the Abbey. 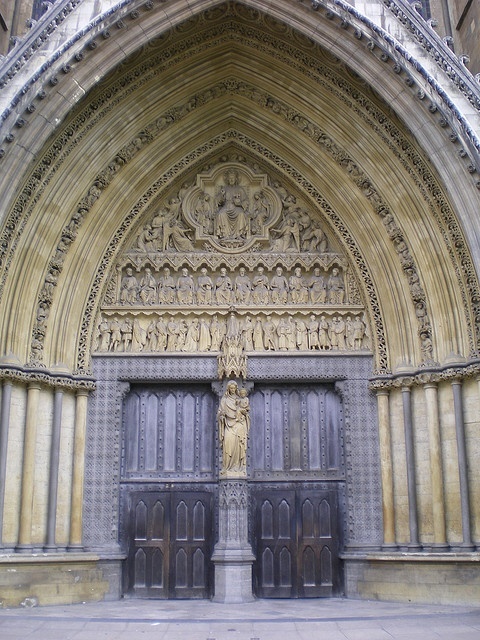 The Great North Door is considered the main entrance to Westminster Abbey and this is where most visitors will start a tour. 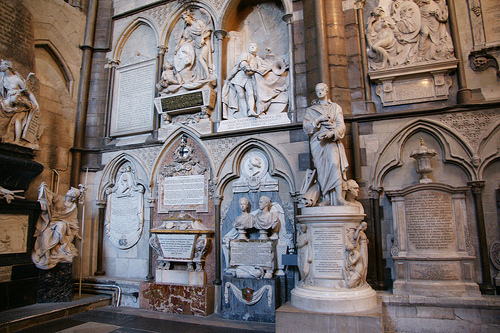 As visitors move further into the church, the area known as the north transept has many tombs and statues depicting several British statesmen, such as Sir Robert Peel and two of Queen Victoria’s Prime Ministers, William Gladstone and Benjamin Disraeli. 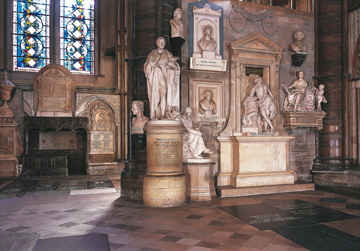 Visitors will then turn left into the eastern end of the church where there smaller chapels which contain the royal tombs and memorials to several monarchs, such as Elizabeth I, Mary I, James I, Charles II, William II and Queen Anne. 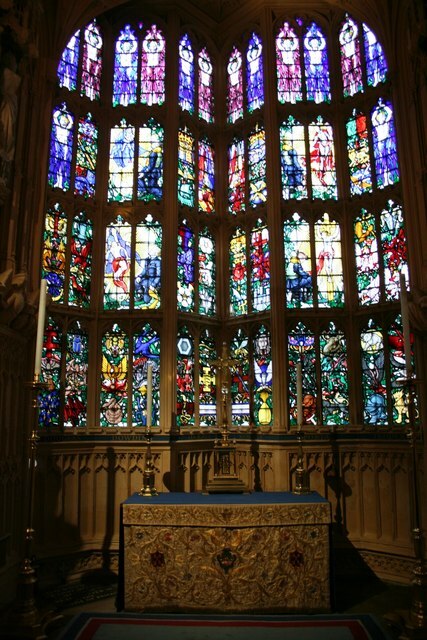 One of the most important and largest of the chapels is the magnificent Chapel of Henry VII which is also known as the Lady Chapel because it was dedicated in 1503 to the Blessed Virgin Mary. The Chapel measures over 103 feet in length and 70 feet wide with a beautiful fan vaulted ceiling that rises to a height of 60 feet. Past the entrance which features a pair of intricate bronze gates that are decorated with the royal Tudor badges is the tomb of Henry VII and his Queen, Elizabeth of York that stands behind the altar and a bronze screen. 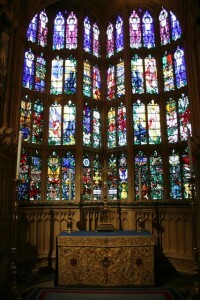 At the east end of the chapel is the smaller Royal Air Force Memorial Chapel which features a stained glass window honoring the Battle of Britain. 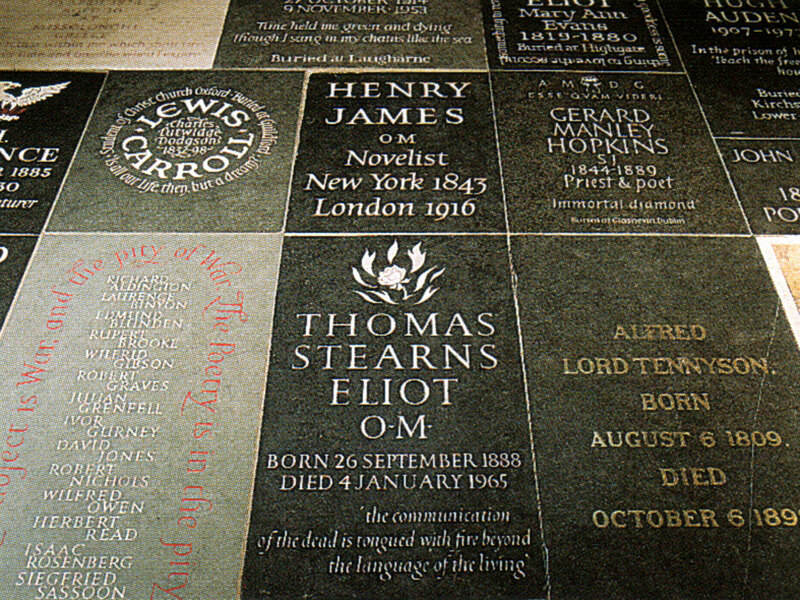 Visitors should look for a memorial stone to Oliver Cromwell which is on the floor in front of the window. To the south of the chapel visitors will find the tomb of Mary, Queen of Scots. As visitors walk back toward the main area of the church, they will pass into the South Ambulatory and several of its smaller chapels. The most notable chapel in this area is the Chapel of St. Edward the Confessor which is closed off from the sanctuary by a large stone screen. Once a more elaborate shrine to St. Edward that featured a decorative stone base with a golden encased tomb covered by an intricate canopy which over the centuries had become a pilgrimage destination. 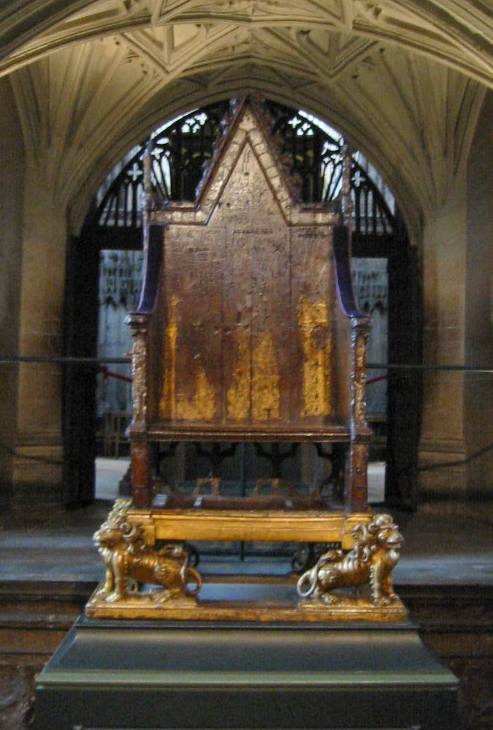 Unfortunately, the shrine was dismantled and removed from the church when the monastery closed in 1540. Then during the reign of Mary I, the monastery was reopened and the shrine was only partially restored. 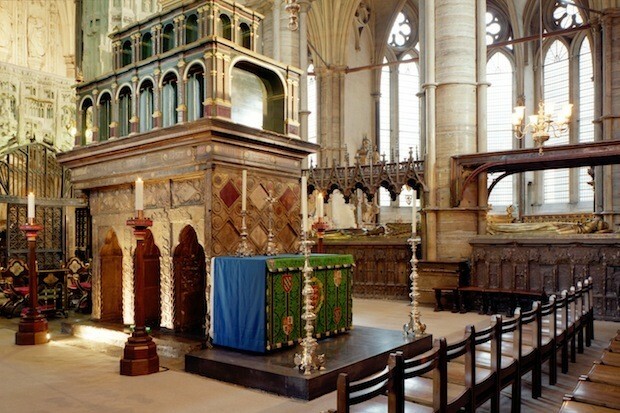 Also, located within this area of the church are the tombs of several kings, such as Henry III who is responsible for rebuilding the current Abbey and the tomb of Henry V which is embellished with scenes of his coronation and once featured precious silver gilt that was stolen in the 1500s. 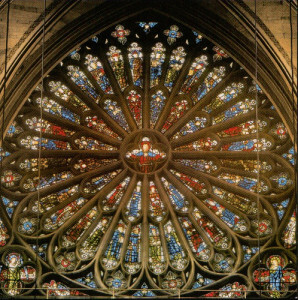 As visitors continue on their tour of Westminster Abbey, they will enter the south transept which features the beautiful Rose Window which was designed by Sir James Thornhill and features 11 of the 12 apostles, Judas has understandably been excluded. 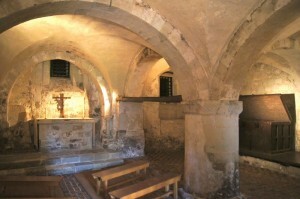 This area of the Abbey has become known as the Poet’s Corner and the first to be buried here was Geoffrey Chaucer in 1400 in a large tomb on the east wall. The other walls are lined with statues and there are also numerous floor memorial plaques have been placed to honor distinguished poets and writers, such as Sir Walter Scott, William Shakespeare, John Dryden, Geoffrey Chaucer, Percy Shelley, Lord Byron, Robert Burns, Charles Dickens, Lord Tennyson, Rudyard Kipling and T S Eliot. 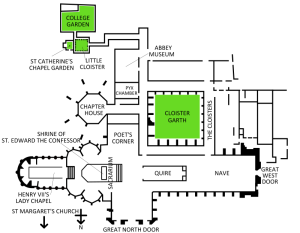 The next area on the tour of Westminster Abbey is located adjacent to the Poet’s Corner and it is the Sanctuary and the Quire. The Sanctuary is considered the main area of the church and this is where the daily religious services as well as special royal events such as coronations, weddings and funerals are held. In front of the high altar is a section of floor which dates back to 1268 and it is known for the famous Cosmati work of an intricate pattern of inlayed colored marble onto a plain marble floor. 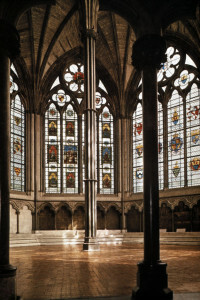 Also located in this area is the Quire with Victorian Gothic-style stalls that are assigned to various officers of the Collegiate Body and the High Commissioners of the various Commonwealth countries with the first four places given to Canada, Australia, New Zealand and South Africa. The Abbey Choir, which is usually 22 boys and 12 men (known as vicars) sing at the church’s daily services. Farther into the church, located below the choir screen which as originally built in 1730, sits the Abbey’s organ. 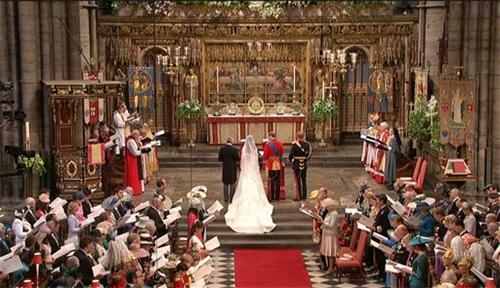 The organ was built by Harrison & Harrison in 1937 and was first used at the coronation of King George VI. 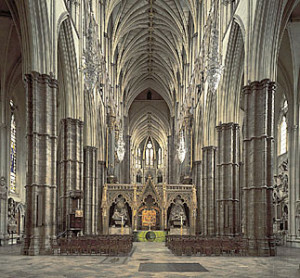 At this point in the tour of Westminster Abbey, visitors will exit the church into an area that was part of the Benedictine monastery. 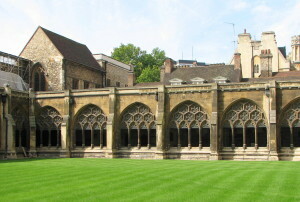 The cloister (a covered walk with a wall on one side and a colonnade which opens to a quadrangle on the other side) dates back to the 13th and 14th centuries and this is where the monks lived and worked. 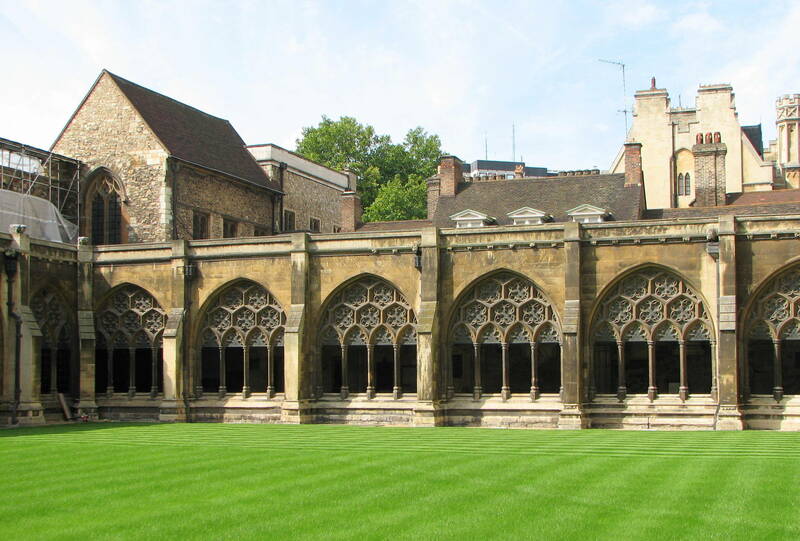 The Chapter House was originally built in the late 13th century and was later restored by Sir George Scott in 1872. 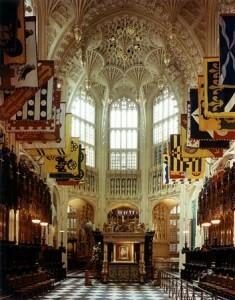 Visitors enter thru double doors which lead into the vestibule and then into the octagonal Gothic-style crypt that has numerous stone benches around the perimeter of the room and large quatre-foiled windows of stained glass panels showing the coats of arms of the sovereigns, abbots and others closely connected to the Abbey. 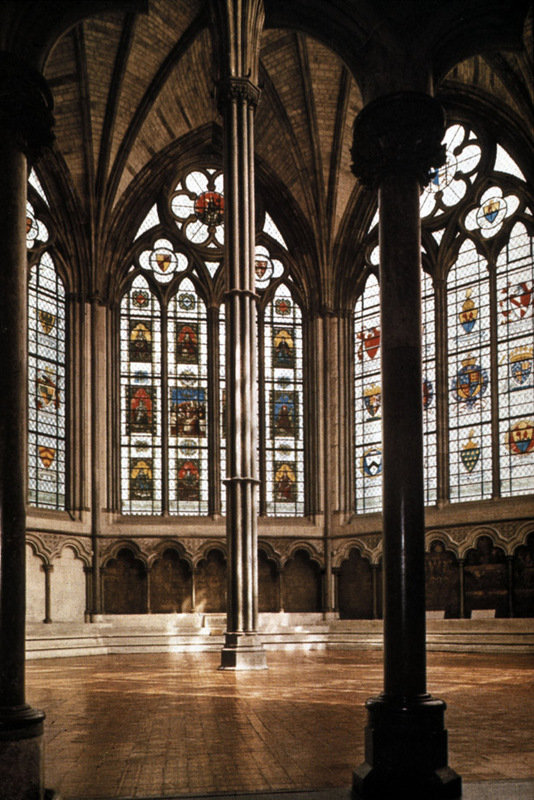 The room was originally used for daily meetings of the Benedictine monks, then years later it was the meeting place of the King’s Great Council in 1257 and then Parliament in the 14th to 16th centuries. Adjacent to the Chapter House is the Pyx Chamber which was the original sacristy of old Edward the Confessor’s church and now contains the oldest altar in Westminster Abbey. (pyx means a small container used in churches to carry the consecrated host) Later this room held the royal treasury and the pyx was used for gold and silver that was used to make coins. 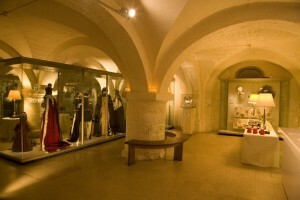 Before leaving the Cloisters, visitors should take time to see the small museum located in the vaulted undercroft beneath the former monks’ dormitory. 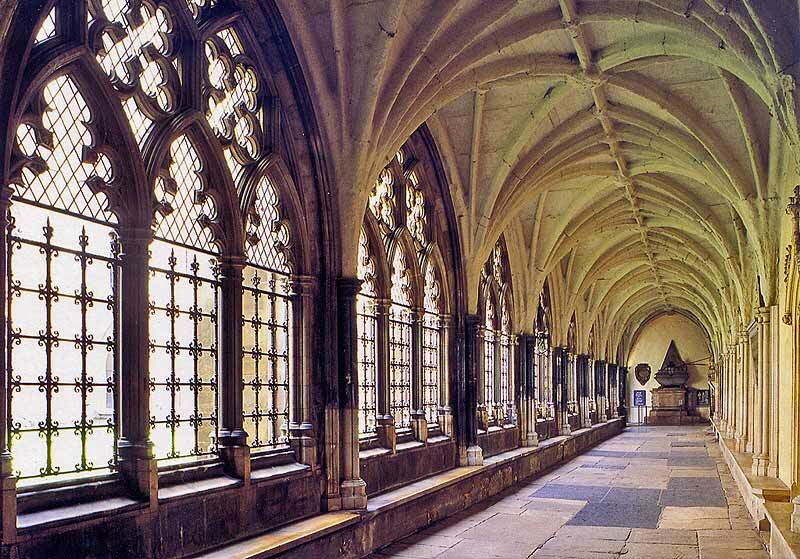 Visitors should then walk around the Cloisters and reenter the Abbey through the side door. 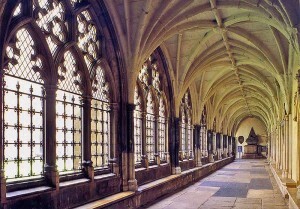 After viewing the Cloisters, visitors will reenter the Abbey into the Nave. (nave means the central part of a church which is intended to accommodate the congregation) Many important memorials can be seen in the Nave and one of the most important of these is Grave of the Unknown Warrior. 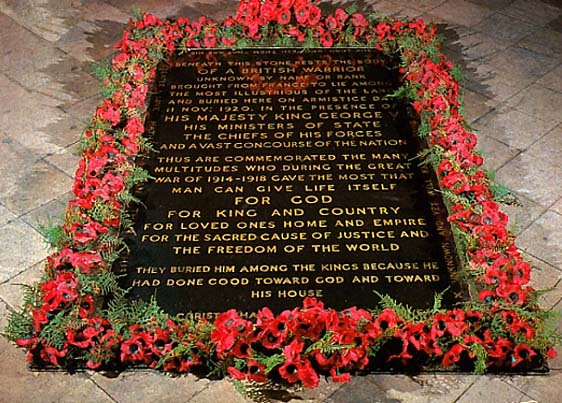 In 1920, in a special ceremony at the Abbey attended by King George V, Queen Mary and with over 100 Victorian Cross recipients lining the Nave the body of an unknown soldier was buried near the west entrance. 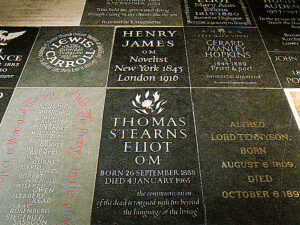 It is the only memorial in the Abbey that it is forbidden to walk on. 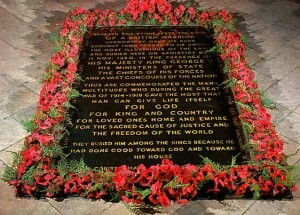 Also located nearby is a stone memorial honoring the former Prime Minister Winston Churchill. 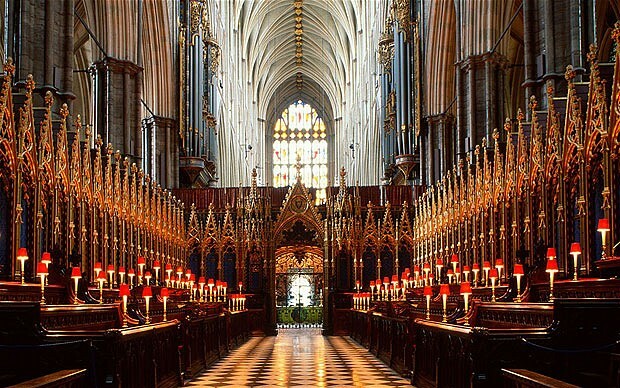 Another item of note at the west entrance are the beautiful Waterford crystal chandeliers that were a generous gift from the famous Guinness family in 1965 on the occasion of Westminster Abbey’s 900th anniversary. Finally, as visitors end the tour and exit the Abbey there is the Abbey Bookstore on the left where they can purchase all types of souvenir items. Legend has it that a fisherman named Aldrich was on the River Thames, not far from the site of the present-day location of Westminster Abbey, and saw a vision of Saint Peter. This would explain the annual custom of the presentation of salmon that Abbey has received in the past from the Thames fisherman and still being presented currently by the Fishmonger’s Company every year. 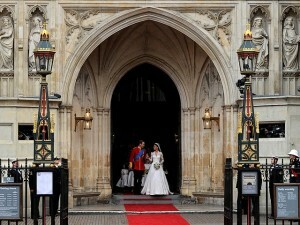 There is old saying, “robbing Peter to pay Paul”, which has it origin in the sixteenth century when money that was intended for the Collegiate Church of St Peter at Westminster (Westminster Abbey) was used for St. Paul’s Cathedral. This entry was posted in Travel and tagged a map of Westminster Abbey, A tour of Westminster Abbey, Barbara Jones, Chapel of Edward the Confessor, Chapel of Henry VII, Chapel of St Edward, Chapter House of Westminster Abbey, Coronations at Westminster Abbey, Cosmati floor in Westminster Abbey, Enchanted Manor, Grave of the Unknown Warrior in Westminster Abbey, Great North Door of Westminster Abbey, history of Westminster Abbey, Lady's Chapel, Poet's Corner, Pyx Chamber of Westminster Abbey, robbing Peter to pay Paul, Rose Window of Westminster Abbey, Royal funerals at Westminster Abbey, St. Peter's Abbey, The Cloisters of Westminster Abbey, The Enchanted Manor, The Nave of Westminster Abbey, The North Ambulatory, The North Transept, The Quire of Westminster Abbey, The Sanctuary of Westminster Abbey, The South Ambulatory, The South Transept, the Waterford Crystal chandeliers of Westminster Abbey, Things to see in London England, Tomb of St. Edward, Travel, Travel to England, Weddings to take place in Westminster Abbey, Westminster Abbey, Westminster Abbey Trivia, when was Westminster Abbey built, where are British Monarchs buried by barbara. Bookmark the permalink.